Translation is a complex human activity involving transfer of meaning between languages, cultures and forms of expression. The NUML therefore relies on highly qualified and skillful translators to provide trusted translation to its valued clients. The Department of Translation and Interpretation, NUML is committed to provide standardized multilingual translations on competitive and affordable rates. Our process for payment of remuneration is simple and transparent. We aim at creating long-term relationships with our clients. We understand that our clients value their privacy, particularly when it comes to personal or confidential business or legal documents. Our clients value fast turnaround time for translation of their documents. While turnaround times vary by language, volume, complexity of the text and form of discourse we generally return a short document within the mutually agreed deadlines. 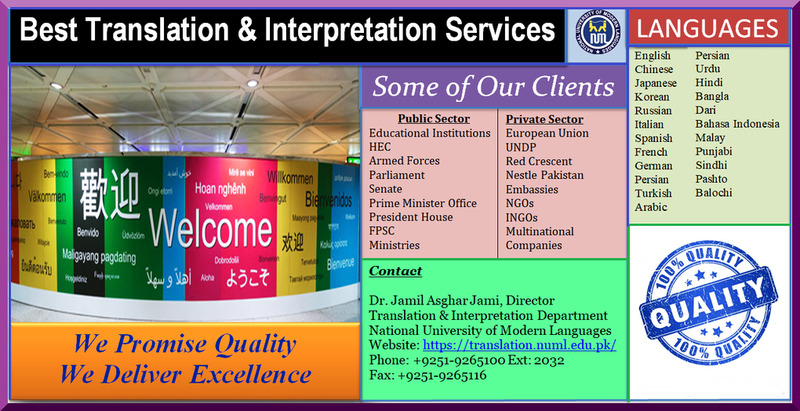 NUML Translation Services is the largest provider of Translation Services in Pakistan. Translation and conversion of existing knowledge into native languages, paved the way to development, dominance and clumination of many civilizations. Our Services include translation in legal, medical, technical, audiovisual and literary translations, as well as community, court and medical interpreting.